California is still struggling with wildfires that have claimed 48 lives. Unfortunately, the number is likely to rise, as more than 200 people are still missing. Thousands of people had to leave their homes. They could only pray that fire will left their home untouched. When frightened residents fled towns, brave firefighters ran in the opposite direction. They drove towards large fires to do their work there. Firefighters from many states have joined forces to extinguish the flames that have threatened thousands of homes. 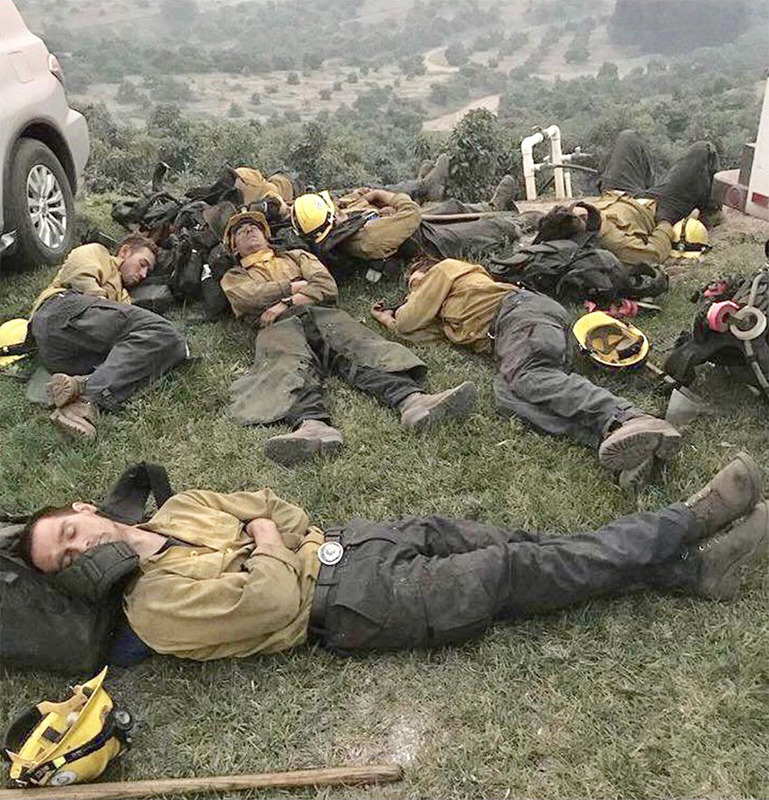 California firefighters have now again shared a photo from last December, on which tired firefighters can be seen. They worked for more than 24 hours, and then fell asleep on the field as a result of fatigue. "This is a photo of our Tehachapi Wildland Fire Crew 11. Our crews have worked hundreds of hours to help battle the Thomas Fire. These firefighters work 24-hour shifts and are pushed to the point of exhaustion. Thank you, for your dedication and hard work to help the communities of Southern California." Meanwhile, fires in California are still not under control. Also this year, firefighters are working to the fullest to limit the fire, and according to recent data, they limited only 30% of the fires. Firefighter planes are being used at many wildfires across the California, and a video of one of the firefighters is coming from Woolsey Fire in Calabasas, California. He took the moment on camera when a large firefighter DC-10 Water Bomber pulled out a flame-extinguishing powder right above him. Thanks to the heroic firefighters for the work they are doing all over the world. You are the real heroes of the people!